Mine was all blue, I think they just changed the color. Ok, I apologize for sounding like 'that idiot' here but what are my options as far as what to order. I don't know if anyone has actually done it but I know I read on one of the pages before about tripling up on the 1/8 thick foam to get 3/8 thickness. I want it very comfortable, so when people said they would not use the HD, is that only on the top layer or both layers? I'm sorry I'm getting so confused. Maybe its because I should be working. I don't know if anyone has actually done it but I know I read on one of the pages before about tripling up on the 1/8 thick foam to get 3/8 thickness. That works great. I re-padded an old creeper to sit on while polishing lower parts of cars, changing brakes, cleaning wheels... I used one layer of the HD I had left, and 5 layers of 1/8" glued together, and it's very comfortable. If I am to go the route of tripling up on the 1/8 in, how much do I need of each type of foam from Kemmler? Installed the air gel foam today. Per original instruction s on page one of this thread. Thanks to the OP and Dave. I haven't sat in the seat yet but I'm sure its great. I actually did this mod as well. Feels a lot better. I topped all of the kemmler foam off with some soft 3/4 foam from micheals and it really made a huge difference, since the kemmler foam isn't particularly plush. I actually prefer my seats now to the probax exige seats. Really makes the ride of the car feel better as well. I realize this is a very old thread, but for those of you that had done this mod according to the instructions in post 1, can you explain the dimensions to me? These don't make any sense. 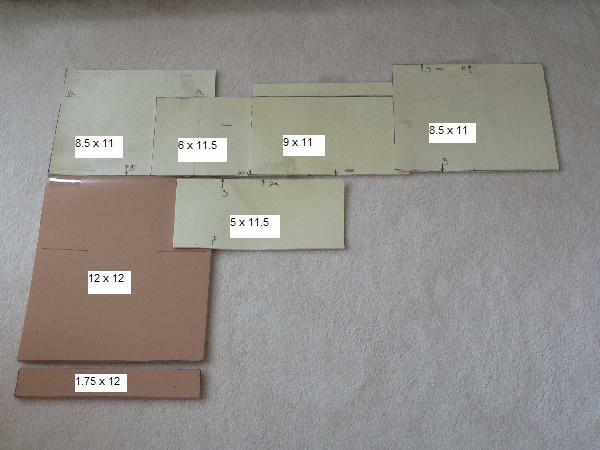 The piece labeled 9x11 is shorter than the piece labeled 8.5x11 next to it?? The gray foam pieces all start at the top edge of the brown foam along one line, so it's not like it's being placed under some other foam. It looks to be more like 7.5x11 or something like that. I'm looking to do this seat mod. Has anyone done it with 06 and up seats? That is amazing thank you. In 6 number 4 what did you use to clean the adhesive? Alcohol? How long did it take and how are the seats now? I used Goo-Gone, it comes right off with a little elbow grease. Bumping this thread again since I still can't find the pictures mentioned on the first page. I'm going to be doing this tonight/tomorrow with my 05 Elise seats (non Probax) and had found a few other non Lotus Talk places that have some instructions. If anyone else has done this and documented it, shoot me a message on Facebook at Justin Loranger (Wilmington, MA, USA). I'm also in the Lotus Owners and Enthusiasts group on Facebook and post there often. Please post pics of your install! I plan on doing this as one of my winter car projects.